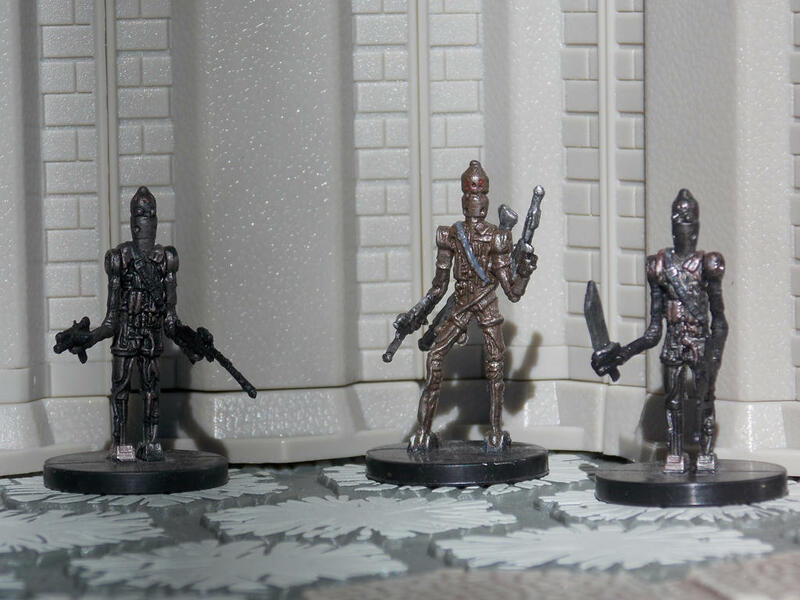 The Tusken Snipers are also a part of the newly completed HoSS Scenario map: Ben Kenobi's Den. Try to get Luke and the droids to safety along with old Ben Kenobi before they are overrun by the Sandpeople. The second part of this release consists of the three remaining IG-88 droids, IG-88A, IG-88C and IG-88D. Contrary to the belief of most of the galaxy, IG-88B was not the only assassin droid of his model. There are three other IG-88 units that share the same sentience as their Bounty Hunter brother. Upon being activated and gaining sentience, the four droids killed all the "organics" in the lab where they were built and escaped. After that, all four droids worked together, led by IG-88A, in an attempt to start a galaxy-wide droid rebellion. Each droid has a different role: as the first unit to gain sentience, IG-88A is the leader of the droids, and manages a droid factory while posing as a human. The factory spits out droids carrying a "sleeper program" which IG-88A intends to activate after flooding the galaxy with his droids. IG-88A also assigned roles to each of the other IG-88 droids. IG-88B was assigned the role of a bounty hunter, IG-88C spent some time as a Mercenary Captain, and IG-88D became a dangerous assassin. In HoSS, each version of IG-88 brings something unique to the table, either alone or all together in a frightening all-droid army. Also with the IG Droids is a new card back. It is included in the card pdfs and is available in the X-2 Card Printing App. We hope you enjoy this release. Thanks to all our playtesters for your help, and may the Force be with you! Great Job guys. Awesome. First post. I really like those two card backs Mac (and it's the first time I'm seeing them)! BRAVO! The Force is obviously with you guys. IG-88B was released back in the Bounty Hunters expansion. Very cool, guys! You've put together quite a universe for yourselves. It's not just our universe. Batmen can play in this universe too. Very cool. Great work, as always. Looks like I need to get three more snipers! Awesome stuff guys n gals! Nice release guys. The snipers look very potent, and the droid army looks fun to play too. Sorry for the noob question, but where did you find the Tusken Raider figs? They look great!